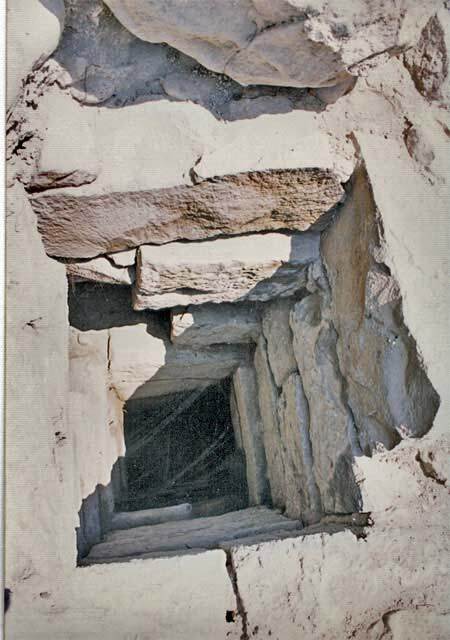 During June–August 2001, a salvage excavation was conducted east of the hot water pool of ‘Ein el-Jarab at Hammat Gader (Permit No. A-3447; map ref. 262490/732153), after antiquities were discovered while overseeing construction. The excavation, undertaken on behalf of the Israel Antiquities Authority and underwritten by the Hammat Gader Company, Ltd., was directed by M. Hartal (field photography), with the assistance of Y. Ya‘aqobi (administration), H. Tahan-Rosen (area supervision), H. Smithline (area supervision and photography), V. Essman, V. Pirsky and T. Kornfeld (surveying), R. Abu Diab (mosaic conservation), N. Zak (drafting) and Y. Gorin-Rosen (glass). 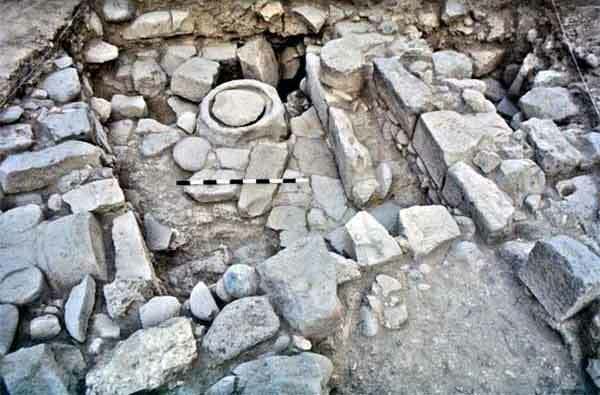 The excavation (400 sq m) was carried out along a steep slope east of ‘Ein el-Jarab—one of the five springs that flow in a valley on the banks of the Yarmuk River, where Hammat Gader is situated (Figs. 1, 2; the ‘Ain Shahan spring is not marked on the map). The slope ends in a stream channel to the north of the tell and in a natural pool, which is the recipient of the water spill from ‘Ein el-Jarab and ‘Ein Bulosand the draining conduit of this water into the Yarmuk River. The bedrock is highest in the northeastern corner of the excavation area and drops 2.6 m to the southwestern corner of the area. Four strata, dating from the fourth century CE until the eleventh century CE, were exposed in the excavation. This part of the site was first inhabited after the bathhouse was established. 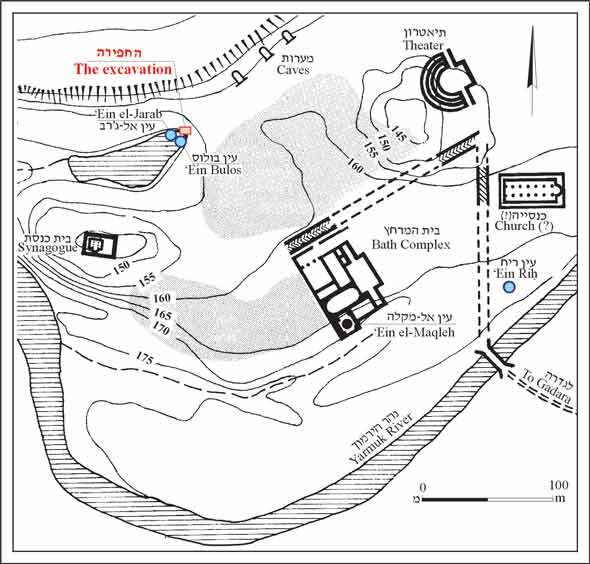 It is apparent that the settlement continued to exist after the bathhouse was destroyed by the earthquake of 749 CE (Y. Hirschfeld, 1997. The Roman Baths of Hammat Gader: Final Report. Jerusalem. Pp. 477–480) and lasted until another earthquake had struck the region in the year 1033 CE. Stratum 4. Bedrock was exposed in the southwestern quarter of the excavation area. It was covered with dark soil that contained a large quantity of organic material, although very scant and non-diagnostic ceramic finds. A well was hewn in the slope when it was first inhabited and two structures were built alongside it. The well, exposed in the southwestern corner of the bedrock surface, was a square rock-hewn pit lined with stone walls (Fig. 3), which contained an accumulation of wet soil that was practically devoid of any finds. A wall was built above the well and its foundations were set on bedrock; above the opening of the well the wall was founded on stone beams that allowed the continued use of the well. 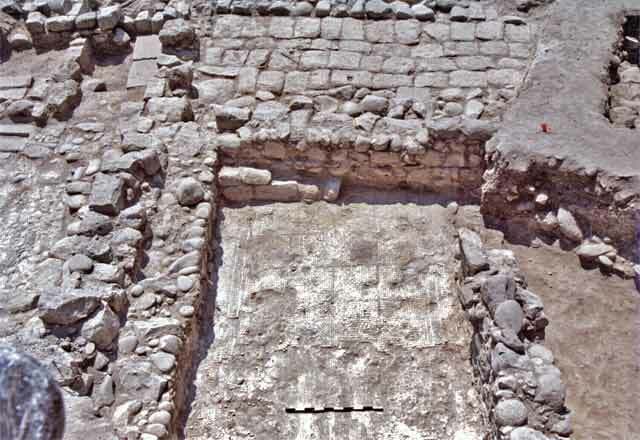 The wall apparently belonged to a building complex that extended northeast of the well, where two walls that formed a corner of a building were exposed (Fig. 4). Small fragments of pottery vessels from the Late Roman period and two worn coins were found on the floor of the building, which was overlain with a new floor on which potsherds from the fourth–fifth centuries CE and a coin from the fourth century CE were found. The finds dated Stratum 4 to the end of the Late Roman period and the beginning of the Byzantine period. Stratum 3. The building constructed in Stratum 4 continued to be used during the Byzantine period. The walls and floors were raised (Fig. 4) and new walls were added. A plastered pool was installed west of the building and numerous fragments of roof tiles were found among its remains, which are apparently indicative of the building’s roof. Fill that partly consisted of chalky material was placed in one of the rooms of the building. The soil that accumulated on top of the fill contained numerous potsherds and glass fragments from the Byzantine period, while pottery vessels from the sixth–beginning of the seventh centuries CE were found in another room. Numerous coins, most of which are worn and unidentifiable, were recovered from the building. The latest coins are ascribed to the time of Justinian I (527–565 CE) and Justin II (565–578 CE). These artifacts date the complex to the sixth or the beginning of the seventh centuries CE. The entrance to the building was set in the southern wall. South of the wall was a stone-lined pit (depth 0.85 m), which contained an elliptical stone trough (0.3×0.4 m; Figs. 3, 5). An intact flask from the Umayyad period, which was apparently produced in Bet She’an, was found inside the trough and a coin dating to this period was discovered near the trough. It therefore seems that this pit also continued to be used in Stratum 2. Stratum 2. Changes were made to the building from Stratum 3, which continued to be used during the Umayyad period. The pool was filled with soil, a wall was built above it and flagstone floors were installed in the southern part of the building. 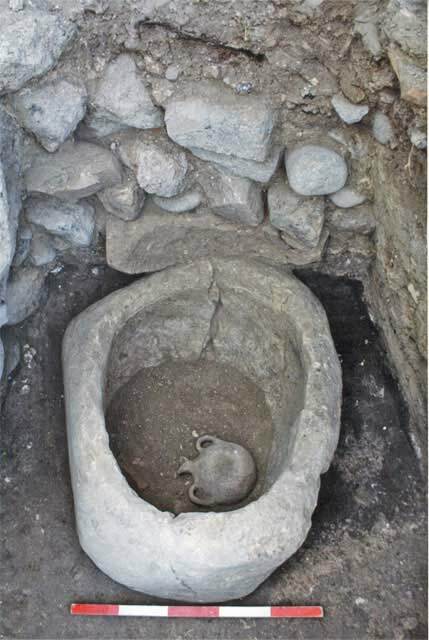 Complete vessels were found on a new earthen floor that was placed in the building: a cooking pot, a krater and a large flask, along with a coal pan and an iron knife. An animal pen built of upright stones that curved to the west was built next to the opening doorjamb in the southern wall. A concentration of building stones arranged in rows was found south of the animal pen; they may have been gathered for use as building material. Architectural elements, including an Ionic capital, a column drum and a stone lintel that bears a relief of a cross and a Syrian inscription (Fig. 6), were found, ex situ, in an open area that extended north of the building. It seems that the building was destroyed in the earthquake of 749 CE and not renovated again. A large public building was constructed in the Umayyad period at the top of the slope, in the northeastern part of the excavation area (Building A; Fig. 7; see the building in the foreground of Fig. 2). Only the western part of the building that consisted of four rooms (1–4) in a northwest-southeast row was exposed; mosaic floors were installed in Rooms 1–3. Rooms 3 and 4 were exposed in their entirety, and the continuation of Rooms 1 and 2 extended east, beyond the limits of the excavation area. The walls were built of fieldstones and bound with mortar. The western façade (W2; length c. 20 m) was by and large destroyed and only the bottom course was preserved along most of its length. A broad opening (width 1.2 m) set in W2 led into Room 2, the largest of the four (width c. 5.5 m; Fig. 8). The room was paved with a colorful mosaic that was poorly preserved (Fig. 9). 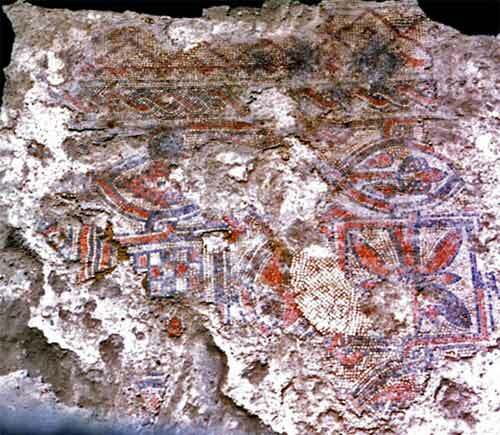 The mosaic, composed of small red, black and white tesserae, was repaired in antiquity with white tesserae. The frame includes a band of rhombuses, a row of small triangles and an intertwined strip. The central carpet is divided into intertwined strips that form rhombuses and strips of squares. Incorporated in the rhombuses and squares are floral patterns, such as a palm tree and flowers, and geometric patterns, such as a checkerboard and rhombuses. Room 1 was paved with a mosaic of larger and only white tesserae (Fig. 10). Room 3 was paved with a mosaic of relatively large, black and white tesserae that was preserved in the western two thirds of the room (Figs. 11, 12). The mosaic was enclosed within a frame of three lines; the middle one was twice as wide as the outer lines. The central carpet was divided into squares. In the middle of each square was a geometric design consisting of a rhombus, a circle and wheel spokes. The design of the mosaic is crude and the level of craftsmanship is not as fine as that of the mosaic in Room 2. White plaster surfaces, applied to a layer of potsherds that covered the stone construction, were preserved on the walls of the room. The northern wall of Room 3 (W27) ends in the west with a doorjamb built of travertine ashlars that was part of an opening leading to Room 4, the most northern room. The bedrock surface in Room 4 was apparently used as the floor, because the collapse in the room was found directly on top of it. Meager and poor finds were discovered on the floors of the rooms, yet in the building collapse was an assemblage of finds that dated to the first half of the eighth century CE; it resembled the pottery assemblage found in the buildings exposed near the Galei Kinneret Hotel in Tiberias (HA-ESI 120), which were destroyed in the earthquake of 749 CE. Hence, it is possible that Building A was ruined in this earthquake, which also destroyed the bathhouse of Hammat Gader. A series of plazas along the steep slope, paved with ashlars (see Fig. 2), was built in this period in front of the building, extending west of the structure to the pool at‘Ein el-Jarab. A system of parallel retaining walls was constructed for this purpose; it was oriented east–west and the spaces between the walls were filled with soil and stones. The close proximity to bedrock aided in preserving the paved plazas in the northern half of the excavation area; in the southern part, the plazas rested on high retaining walls and thus, were completely destroyed and only the bottom part of the walls survived. A circular well (diam. 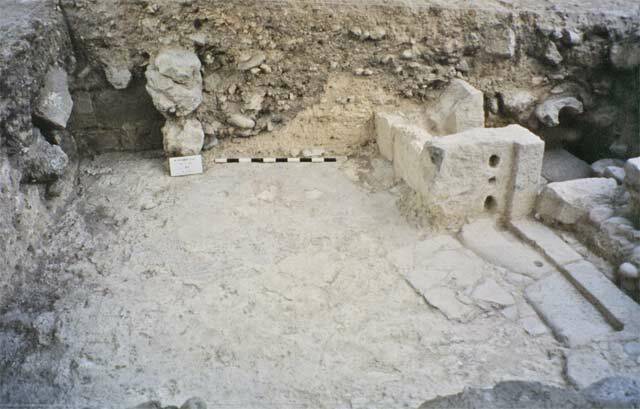 0.9 m) was installed in the center of the plaza, exposed in the northwestern part of the excavation. The upper part of the well (depth 1.1 m; Fig. 13) was dug and lined with stones and the lower part was bedrock hewn. 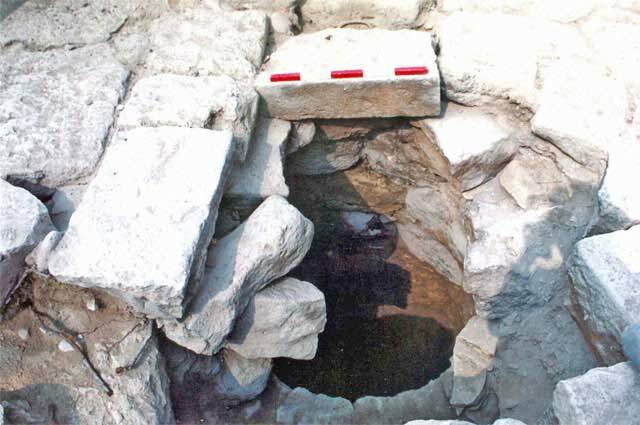 The excavation of the well was suspended at a depth of c. 2.9 m when a layer of soil that was saturated with water was reached. It seems that the well was hewn to the water table level of ‘Ein Bulos, whose water is potable. The paving slabs east of the well were slightly sunken and formed a kind of drainage channel that conveyed the runoff toward the well. Stratum 1. After Building A and probably the southern part of the plaza were destroyed in the 749 CE earthquake, a long period elapsed until settlement was renewed. 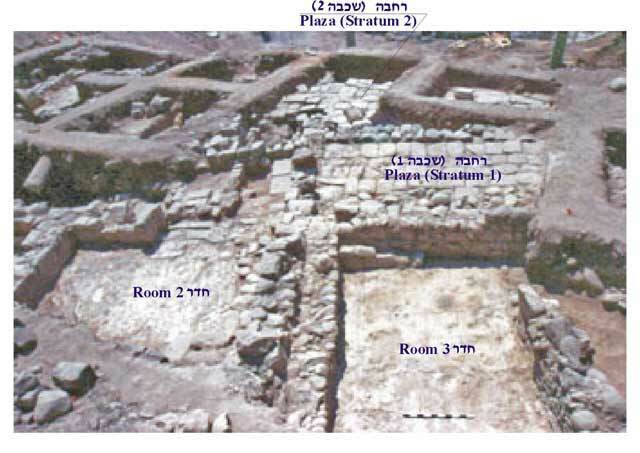 This is indicated by the accumulation of a soil layer on the northern abandoned plazas; the well installed in Stratum 2 was negated and blocked during the settlement hiatus. A large quantity of vessels from the ninth–tenth centuries CE was found in the upper part of the fill in the well, which attests to the period of its blockage. Part of the public building was renovated in the next phase – probably during the ninth century CE – and the open areas were rebuilt along its front side. A new well was hewn c. 0.85 m east of the old well, which was covered with the pavement of the new plaza (see Fig. 2). It seems that some of the roughly hewn stones and ashlars used in this construction phase were taken from the southern plazas, which had collapsed and were never rehabilitated. The new well, surrounded by a plaza, enclosed within walls (Figs. 14, 15), was square (c. 0.85×0.85 m; Fig. 16) and lined with ashlar stones. Several of the lining stones collapsed in the northeastern corner and the bedrock­-hewn shaft was visible. A section of a stone pipe that had been taken from the ruins of the bathhouse (see Figs. 14, 15) was placed on the mouth of the well; the opening of the pipe was covered with a stone slab. 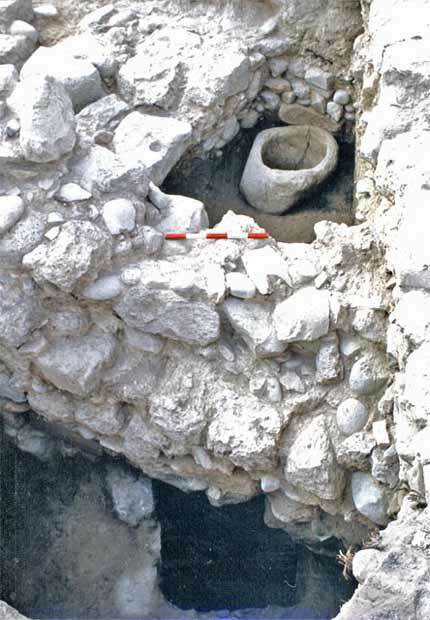 The well, which was excavated to a depth of 2.3 m without reaching its bottom, contained meager finds that included pottery fragments from the Early Islamic period. A small Corinthian capital was recovered from deep inside the well. The two northern rooms (3, 4) of Building A were not rehabilitated and the stone collapse of their walls remained on the floors. A new building (B) was founded over the two southern rooms (1, 2). The wall of the western façade was renovated and new walls were built next to some of the older walls and above them. 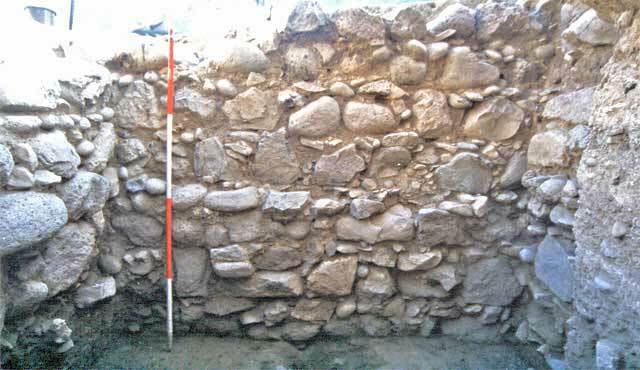 A pillar for carrying an arch, generally aligned north–south, was incorporated in a new wall built along the north wall of Room 2. The arch indicates that the length of Room 2 was probably twice its exposed size. A new floor of packed soil and pebbles (Fig. 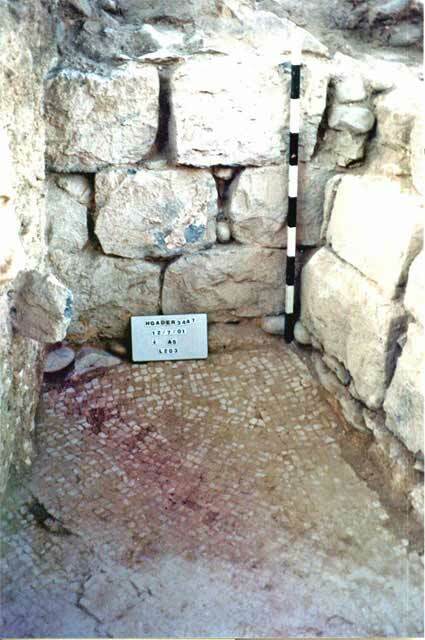 17) was laid atop the undermined mosaic floor of Room 2. 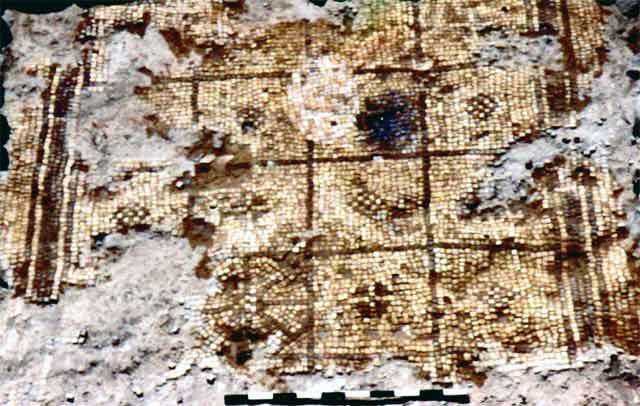 Although the floor was overlaid with scant artifacts, it can be attributed to the ninth–tenth centuries CE. Several changes were made to Room 2 during its use. A partition of long ashlars was built above the soil and pebble floor; it was generally aligned east–west and divided the space into two. An earthen floor that contained a large amount of plaster was laid south of the partition and to its north a pavement of flat fieldstones was installed. 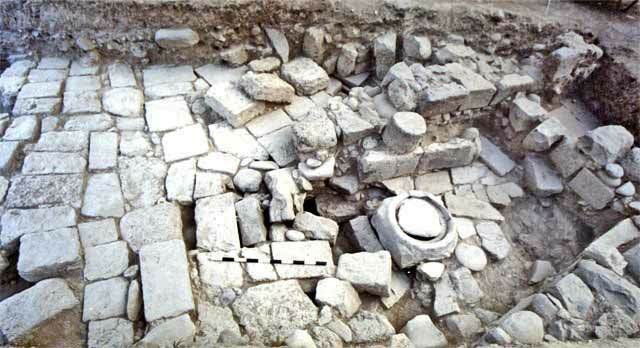 Several potsherds were found on the new floors and dated them to the ninth–tenth centuries CE. The use of the mosaic floor from Stratum 2 was renewed in Room 1, which continued to be used until the building was destroyed a second time. It seems that an earthquake also destroyed Building B. The collapse of stone walls was found in the northeastern quarter of Room 2. The western wall of the building was undermined and several of the stones were missing from its lower courses. Room 1 was entirely blocked with the stone collapse, as well as many pieces of fresco and roof tiles, along with fragments of pottery vessels, the latest of which dated to the tenth century CE. These finds suggest that the building was destroyed in the earthquake of 1033 CE and was not rehabilitated again. 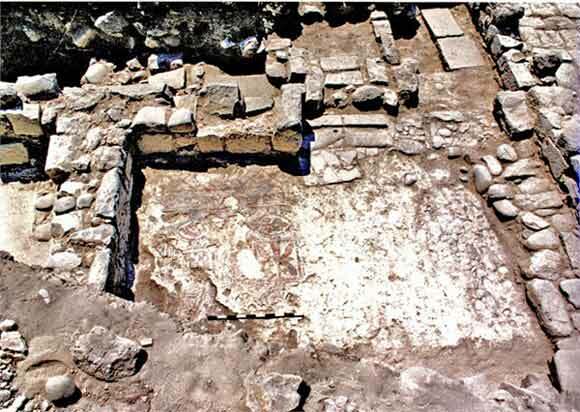 It seems that Buildings A and B (Strata 2 and 1) were public buildings with plazas in front of them, built on the edge of a hot-water pool in an area that was unsuitable for living quarters because of the strong smell of sulfur and excessive heat. They were intended to serve the bathers in the hot springs, possibly as dressing or massage rooms, similar to the buildings constructed there in recent years. 1. Location map (based on Y. Hirschfeld 1997. The Roman Baths of Hammat Gader: Final Report. Jerusalem, p. 3). 3. Stratum 4, the well and a wall above it, looking southeast. Above, a trough from Stratum 3. 4. Strata 3 and 4, walls of a building, looking north. 5. Stratum 3, stone trough, looking east. 6. Stratum 2, stone lintel. 8. Building A, Room 2, looking west. 9. Building A, mosaic floor in Room 2, looking west. 10. Building A, Room 1, looking south. 11. Building A, Room 3, looking west; in background, a plaza from Stratum 1. 12. Building A, Room 3, looking west. 13. Stratum 1, plaza pavement that covers the well from Stratum 2, looking north. 14. Stratum 1, pavement and a well, looking north. 15. Stratum 1, a plaza surrounded by walls around the well, looking west. 16. Stratum 1, the well shaft, looking east. 17. Building B, Room 2, looking south.